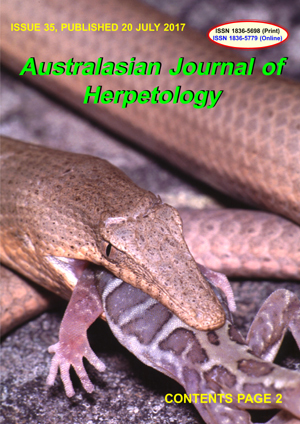 Australasian Journal of Herpetology Issue 34, published 20 July 2017. The inevitable break-up of the Australian legless lizard genera Delma Gray, 1831 and Aprasia Gray, 1839, formal descriptions of 13 well-defined Pygopodid species, as well as a further improvement in Pygopodid taxonomy and nomenclature. ... Raymond T. Hoser, pp. 3-32. ... Raymond T. Hoser, pp. 33-42. A logical break-up of the genus Telescopus Wagler, 1830 (Serpentes: Colubridae) along phylogenetic and morphological lines..
... Raymond T. Hoser, pp. 43-53. A new genus-level classification of the Australian Funnel-web Spiders (Hexathelidae: Atracinae). ... Raymond T. Hoser, pp. 54-56. Taxonomic vandalism by Wolfgang Wüster and his gang of thieves continues. New names unlawfully coined by the rule-breakers for species and genera previously named according to the rules of the International Code of Zoological Nomenclature. ... Raymond T. Hoser, pp. 57-63. 10 recent illegally coined names by the taxonomic vandal, Wolfgang Wüster and his gang of thieves, with correct scientific names shown in a table. ... Raymond T. Hoser, from page 62. Over 20 more illegally coined names by the taxonomic vandal, Wolfgang Wüster and his gang of thieves, with correct names shown in a table. ... Raymond T. Hoser, from page 63.